As one of our signature holes this par 5 is long and challenging but can be very rewarding if played right. 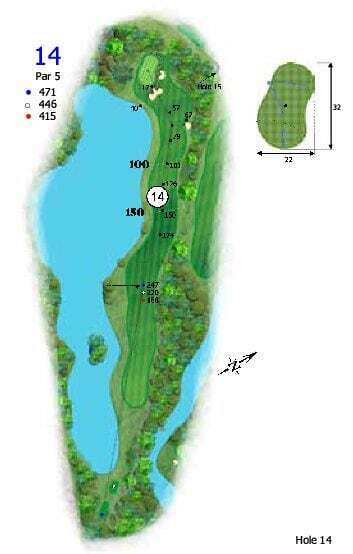 Your tee shot will be tested by the large lake on the left which stretches the entire length of the golf hole. The right side is fenced by dense trees that come into play when trying to avoid water. A tough green that slopes away from you and is protected by two deep bunkers makes this hole one of the most scenic and challenging holes to play. Safe Play: Take a long iron or utility wood up to the largest part of the fairway, from here the fairway gets very narrow so layup with a middle iron to set up only a short iron to a well bunkered green. Aggressive Play: Hit an accurate driver just right of centre of the fairway. If you are confident hitting over water and bunkers take aim at the green and don’t look back, anywhere on or around the green is a great chance at birdie on this long par 5.